Objective: The objective of this study was to assess the current status of Canadian predoctoral implant programs in terms of director demographics, curriculum characteristics and preferences in the techniques that are used to teach and carry out implant therapy. We compared the findings to analogous data recently acquired from dental schools in the United States. Methods: A survey instrument was sent electronically to directors of predoctoral implant programs at all 10 accredited dental schools in Canada. Results: All 10 dental schools responded to the survey. Program directors were affiliated with prosthodontics (90%) or oral surgery (10%) departments. Most Canadian institutions (90%) formally integrate their implant program into the third year of the curriculum. Clinical implant curricula include simulated exercises and direct patient care under supervision in 90% of predoctoral programs. Frequently taught restorative modalities include the posterior single-tooth implant crown (100%), mandibular implant-retained overdenture (90%), anterior implant-supported single crown (60%) and posterior 3-unit implant-supported bridge (50%). All programs reported the routine use of guided surgery planning software and surgical guides to aid in implant treatment planning. Preferred clinical protocols include implant-level impressioning (90%), use of open-tray impression copings (70%), custom abutment fabrication (60%), coronal fixation by screw-retention (60%) and use of titanium (100%) or zirconia (60%) abutments. Half of the program directors reported feeling that graduating students were adequately prepared to provide implant therapy on graduation. The demographics of Canadian directors of predoctoral implant programs were very similar to those of their counterparts in the United States. The largest divergences existed in clinical curriculum preferences and subjective perception of student preparedness in oral implantology on graduation. Conclusion: Greater homogeneity exists among Canadian dental schools with regard to predoctoral implant program curricula, compared with those in the United States. Further investigation is warranted to examine the reasons for Canadian program directors’ current perceptions of lack of preparedness of graduating predoctoral students. Since the discovery of osseointegration, the use of dental implant therapy has notably increased as partly and completely edentulous patients seek a conservative, predictable and potentially esthetic treatment option for tooth replacement.1-3 Implant therapy is attractive to both clinicians and patients alike because of its relatively high success rate,4-7 improvements in patient quality of life measures following implant restoration8-10 and its long-term cost-effectiveness compared with other prosthetic options.11-14 Such factors have contributed to the widespread use of dental implants as an approach to tooth replacement in cases ranging from a missing single tooth to partial and even complete edentulism. As a result of changing population demographics in both Canada and the United States,15 aging patients with a favourable socioeconomic standing, who have preserved the majority of their dentition and require tooth replacement or are looking to reconstruct a debilitated dentition, are increasing the demand for implant therapy. Subsequently, there has been an increase in demand for clinicians who are adequately trained and competent to provide this service. These trends have resulted in a need for both European16 and Canadian dental academic institutions and their representative organizations17 to include comprehensive dental implant curricula at both the postdoctoral and predoctoral levels. At the postdoctoral level, the focus is purposefully on surgical management and preparation of sites for oral implants, as well as complex, implant-borne prosthetic rehabilitation. However, at the predoctoral level, single-tooth implant and implant overdenture therapies are feasible and, thus, promote this standard of care among contemporary general dentists. As a result, most academic institutions in Europe, the United States and Canada have established predoctoral dental implant programs. These more recent queries of graduating dental students should not be overlooked, as dental graduates who are exposed to implant therapy in formal didactic modalities (i.e., lectures, seminars, case series reviews) and preclinical simulations in the laboratory and who are engaged in the clinical management of implant patients at the predoctoral level are overwhelmingly more adept and confident in providing implant therapy as a general practitioner. 22 Adequate instructional experiences at the predoctoral level have been shown to result in dentists restoring more implants after graduation, referring more patients to surgical specialists and having a continuing desire to broaden their education in implant dentistry once in practice.23,24 This stands in stark contrast with graduates of programs that lack a formal implant curriculum. The objective of this study was to survey predoctoral implant program directors of schools accredited by the Commission on Dental Accreditation of Canada (CDAC) to assess current didactic and clinical preferences in the provision of implant therapy at the predoctoral level and compare the findings with those from U.S. institutions. Such data on current clinical instructional preferences are of value, as in 2015 all CDAC-accredited Canadian dental schools introduced implant therapy into predoctoral curricula. Canadian dental institutions looking to modify predoctoral implant programs may also use this information to help augment their programs. Predoctoral implant program directors were identified for the 10 CDAC-accredited dental schools in Canada.26 The appropriate contacts were identified by searching the web site of each institution's dental school. Contact was made via email to verify the person's position as the predoctoral implant program director. A draft survey was developed to query program directors in terms of demographics, diagnosis, treatment planning, restorative techniques, preferences and trends in dental implant therapy. After review and revision by faculty members at the University of Iowa College of Dentistry, a final version of the survey was accepted. An online survey tool called Qualtrics (Provo, Utah, USA) was used to create the survey and collect data from respondents. The survey included 15 questions on demographics. Some, such as "Please select from the categories below any specialty for which you have certification" were contingent on the participant answering "Yes" to an earlier question, i.e., "Do you have specialty training?" Following the demographic section, the survey contained 12 questions relating to the predoctoral implant program's educational methods, diagnosis, treatment planning, restorative techniques, preferences and trends in dental implant therapy. Finally, program directors were asked what they feel is the most beneficial instructional method in preparing students to provide implant therapy on graduation and whether they feel their program prepares students adequately to provide routine dental implant therapy for tooth replacement on graduation. A letter detailing the objective of the study and containing a link to the survey was emailed to each predoctoral implant director on 12 August 2013. If a survey response or email message was not received from the institution, a follow-up email was sent 3 weeks later and every 3–4 weeks until 5 November 2013. Following compilation and investigation of the results, we noted multiple incomplete responses. Thus, directors with incomplete responses were contacted again by email on 6 January 2014. All participants were able to opt out by responding to any of the emails indicating that they did not wish to be contacted or by simply not completing the survey. In addition, after beginning the survey, participants had the option of not answering any 1 or all of the questions. Data were imported into a SPSS dataset. Simple descriptive statistics were used to present the data and information was summarized using SPSS version 22.0 (IBM Inc., New York, NY). Because the sample size was small (10 schools), no statistical tests for associations were conducted. This study was approved by the University of Iowa Institutional Review Board (#201307759). Predoctoral implant program directors from all 10 Canadian schools participated in the study (100% response rate). Most program directors were men (80%), aged ≥?51 years (60%) and had practised for at least 21 years (80%) (Table 1). All program directors had undergone specialty training, with 90% certified in prosthodontics and 10% in oral and maxillofacial surgery. Of the 5 program directors who responded to the question on board certification, 4 were certified in prosthodontics and 1 was certified in oral and maxillofacial surgery. With regard to implant therapy training, 70% indicated that they had formal training. Forty percent (40%) of program directors had worked for more than 20 years in the same institution and 30% had served as predoctoral implant program directors for 5–6 years. Table 1 Characteristics of participants. *Note: 5 of the 10 directors reported board certification. No. years practising dentistry ? No. years working in this institution ? Number of years served as predoctoral implant program director ? In terms of institutional characteristics (Table?2) most program directors were affiliated with the prosthodontics department (70%). The various departments involved in the predoctoral implant program included: prosthodontics (90% of all schools), oral and maxillofacial surgery (90%), periodontics (60%), oral and maxillofacial radiology (50%), restorative dentistry (40%) and orthodontics (20%). The predoctoral program was integrated into the first year (10%), second year (50%), third year (90%) and fourth year (70%) of the dental school curriculum. Table 2 Institutional characteristics of Canadian predoctoral dental implant programs. Departments involved in predoctoral implant program ? Years of the dental curriculum in which the predoctoral implant program is integrated ? Half of the program directors said that they used 2 implant systems in their program, 30% used 3 systems and 20% used only 1 system (Table 3). Apart from didactic components, both simulation exercises (without direct patient care) and direct patient care under supervision were implemented in 90% of predoctoral implant programs. The most frequently taught restorative implant methods were posterior single-implant-supported single crown (100%), mandibular implant-tissue-supported overdenture (90%), anterior implant-supported single crown (60%) and posterior 3-unit implant-supported bridge (50%). All programs required their students to prepare surgical guides before implant placement. Students at all schools routinely used guided surgery planning software in their undergraduate implant curriculum (Table 4). Fixture-level impression methods were taught most often (90% of schools). Open-tray impression techniques were used in 70% of schools and the closed-tray technique was used in 30% of schools. The most frequently used abutment type was a custom abutment (60%). Titanium (100%) and zirconia (60%) were the most frequently used abutment materials. The screw-retention fixation method (60%) was slightly favoured over cement retention (40%). Half of the program directors "disagreed" that the predoctoral program adequately prepared students to provide routine dental implant therapy for tooth replacement after graduation (Table?5). Only 20% "strongly agreed" and 30% "agreed" that the program adequately prepared students for this work. A vast majority of program directors (90%) responded that direct supervised patient care is the most beneficial instructional method. Table 3 Characteristics of Canadian predoctoral dental implant programs. Number of implant systems to which predoctoral students are exposed ? Aside from the didactic component, exercises included in implant program ? Restorative implant methods taught in clinic ? Are students required to prepare a surgical guide or a set of surgical guides before surgical implant placement? ? Table 4 Implant techniques taught in Canadian dental schools. Impression modalities primarily taught ? Impression technique primarily taught ? Abutment type used primarily in program ? Abutment materials used Fixation modality primarily taught ? Table 5 Opinions of directors about the effectiveness of the predoctoral dental implant program taught at their school. Predoctoral program adequately prepares students to provide routine dental implant therapy for tooth replacement upon graduation ? Instructional method that is most beneficial ? In this cross-sectional survey, the characteristics of predoctoral dental implant programs at all 10 Canadian institutions were assessed from the responses of the institutions' predoctoral implant program directors, which provide a comprehensive overview of current trends in Canadian predoctoral implant education. Assessment was based on program director demographics, curricular content and preferences and program directors' perceptions of graduating students' preparedness to provide dental implant therapy on graduation. In a similar survey of predoctoral dental implant programs in the United States, program and curricular heterogeneity was observed between regions.25 As Canada has fewer dental schools (10), our findings show less heterogeneity among institutions or regions. Whether such relative uniformity among Canadian institutions is intentional or conditional is indiscernible at this time. Demographically, Canadian predoctoral implant program directors are predominantly men, aged 51 or older, have specialty training in prosthodontics and have been practising clinical dentistry for 21 or more years. Such characteristics are in line with those of U.S. predoctoral implant program directors, where a clear majority are men, older than 51 years of age, have specialty training in prosthodontics and have been practising dentistry for 21 or more years.25 Program directors in Canada are also predominantly affiliated with restorative, rather than surgical, disciplines in their institution, and a predominant majority have received formal training in oral implantology, which also mirrors U.S. data. 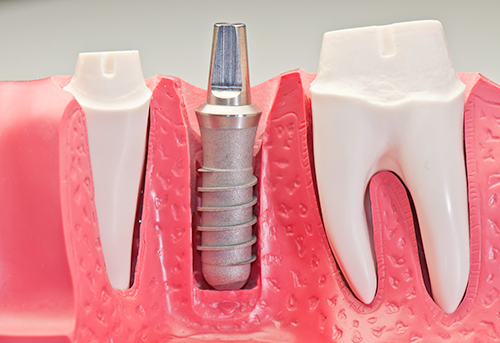 A likely cause for this observed trend is that implant dentistry is fundamentally a restorative treatment approach, supported by surgical protocols. In addition, most predoctoral implant learning has been focused on treatment planning and restoration of implants, rather than surgical management of the implant patient. As implant dentistry continues to become more pervasive and surgical protocols diffuse into the predoctoral curriculum,27 one may predict an increase in program directors with surgical backgrounds in the future. Because of the complexity and interdisciplinary nature of implant-based treatment approaches, it is not surprising that most Canadian dental schools choose to incorporate implant curricula into the third and fourth years of dental school, a trend also seen in the United States. The need for sufficient didactic, clinical and laboratory skills to facilitate implant therapy is a likely a reason for this observed timing. One aspect of curriculum decisions that appears to differ between Canadian and U.S. institutions is the fact that Canadian institutions seem to favour heterogeneity in implant-systems exposure, with most Canadian institutions exposing predoctoral students to 2 or 3 systems. In contrast, U.S. institutions clearly favour the use of a single system at an institution. Whether such preferences are based on class size or the preferences of the program directors themselves is difficult to establish and a limitation of this study. However, many U.S. dental schools receive subsidized or donated implant componentry from manufacturers, which defrays costs for patients and incentivizes treatment among predoctoral students. Such agreements between manufacturers and institutions in the U.S. could be contributing to these observations. Aside from didactic elements, the overwhelming majority of Canadian predoctoral implant programs offer both simulated, as well as direct patient care experiences, to their students. Posterior single-tooth implant-supported restorations and mandibular implant-tissue-supported overdentures are the predominant restorative methods taught. In addition, anterior single-tooth implant-supported restorations, as well posterior 3-unit implant-supported fixed partial dentures have a significant presence in Canadian predoctoral implant curricula. Complete unanimity exists among Canadian institutions with regard to the requirement for predoctoral students to prepare a surgical guide or a set of surgical guides before placement of the implant fixture. These practices are identical to those in U.S. predoctoral implant program curricula. Comparing technical protocols favoured in Canadian and U.S. dental schools reveals the greatest philosophical differences. Although both U.S. and Canadian implant program directors overwhelmingly favour fixture-level, as opposed to abutment-level impression modalities, Canadian curricula tend to favour open-tray impression techniques whereas U.S. institutions favour closed-tray techniques. U.S. institutions are currently split with regard to teaching primarily stock or custom abutments in predoctoral curricula. Canadian institutions appear to be slightly in favour of abutment customization. This observation could be explained by the fact that Canadian institutions seem to prefer screw retention (which often requires custom componentry), whereas U.S. institutions seem to favour cement retention as the primary fixation method for fixed-implant restorations. When considering abutment biomaterials, Canadian and U.S. institutions are identical, with 100% employing titanium, 60% employing zirconia and 30% employing noble metal (cast) abutments. Most Canadian program directors feel that direct, supervised patient care is th e most useful instructional method in terms of student growth, learning and progress in the area of oral implantology. This view parallels the observations of U.S. program directors. With regard to student preparedness, U.S. data show that most predoctoral implant program directors feel positive about the level of preparedness of graduating dental students to provide implant therapy in practice. However, only half of Canadian program directors feel positive about this outcome measure. Why half feel negative about the preparedness of graduating students to perform implant therapy remains in question and should be the topic of a follow-up investigation. The results of this study are generalizable as all 10 dental schools in Canada participated in the survey. However, because of the limited sample size (resulting in lack of adequate power to conduct meaningful analyses), no statistical tests for associations between implant curriculum and school characteristics were conducted. The results of this study demonstrate many parallels between Canadian and U.S. dental schools pertaining to predoctoral implant program director demographics, as well as institutional curriculum preferences. However, several areas of divergence exist: Canadian institutions show greater implant curriculum homogeneity, preferences for incorporation of guided surgery software during case planning, open-tray impressioning, abutment customization and screw retention, compared with U.S. institutions. Of potential concern to Canadian institutions, however, is why half of predoctoral implant program directors feel their students are inadequately prepared to provide routine dental implant therapy on graduation. Dr. Barwacz is assistant professor, Craniofacial Clinical Research Center, The University of Iowa College of Dentistry, Iowa City, Iowa. Dr. Avila-Ortiz is assistant professor, department of periodontics, The University of Iowa College of Dentistry, Iowa City, Iowa. Br?nemark PI. Osseointegration and its experimental background. J?Prosthet Dent. 1983;50(3):399-410. Lekholm U. Clinical procedures for treatment with osseointegrated dental implants. J?Prosthet Dent. 1983;50(1):116-20. Zarb GA. Introduction to osseointegration in clinical dentistry. J?Prosthet Dent. 1983;49(6):824. Jung RE, Pjetursson BE, Glauser?R, Zembic?A, Zwahlen?M, Lang?NP. A systematic review of the 5-year survival and complication rates of implant-supported single crowns. Clin Oral Implants Res. 2008;19(2):119-30. Pjetursson BE, Thoma D, Jung R, Zwahlen?M, Zembic?A. A systematic review of the survival and complication rates of implant-supported fixed dental prostheses (FDPs) after a mean observation period of at least 5 years. Clin Oral Implants Res. 2012;23(Suppl 6):22-38. Berglundh T, Persson L, Klinge?B. A systematic review of the incidence of biological and technical complications in implant dentistry reported in prospective longitudinal studies of at least 5 years. J?Clin Periodontol. 2002;29(Suppl 3):197-212; discussion 232-3. Papaspyridakos P, Mokti M, Chen?CJ, Benic?GI, Gallucci?GO, Chronopoulos?V. Implant and prosthodontic survival rates with implant fixed complete dental prostheses in the edentulous mandible after at least 5 years: a systematic review. Clin Implant Dent Relat Res. 2014;16(5):705-17. Att W, Stappert C. Implant therapy to improve quality of life. Quintessence Int. 2003;34(8):573-81. Heydecke G, Locker D, Awad?MA, Lund?JP, Feine?JS. Oral and general health-related quality of life with conventional and implant dentures. Community Dent Oral Epidemiol. 2003;31(3):161-8. Fillion M, Aubazac D, Bessadet M, Allègre?M, Nicolas?E. The impact of implant treatment on oral health related quality of life in a private dental practice: a prospective cohort study. Health Qual Life Outcomes. 2013;11:197. Heydecke G, Penrod JR, Takanashi Y, Lund JP, Feine JS, Thomason JM. Cost-effectiveness of mandibular two-implant overdentures and conventional dentures in the edentulous elderly. J?Dent Res. 2005;84(9):794-9. Bouchard P, Renouard F, Bourgeois D, Fromentin?O, Jeanneret?MH, Beresniak?A. Cost-effectiveness modeling of dental implant vs. bridge. Clin Oral Implants Res. 2009;20(6):583-7. Vogel R, Smith-Palmer J, Valentine?W. Evaluating the health economic implications and cost-effectiveness of dental implants: a literature review. Int J Oral Maxillofac Implants. 2013;28(2):343-56. Zitzmann NU, Krastl G, Weiger R, Kühl?S, Sendi?P. Cost-effectiveness of anterior implants versus fixed dental prostheses. J?Dent Res. 2013;92(12 Suppl):183-8S. Elani HW, Harper S, Allison?PJ, Bedos?C, Kaufman?JS. Socio-economic inequalities and oral health in Canada and the United States. J?Dent Res. 2012;91(9):865-70. Lang NP, De Bruyn?H, 1st European Consensus Workshop in Implant Dentistry University Education. The rationale for the introduction of implant dentistry into the dental curriculum. Eur J Dent Educ. 2009;13(Suppl?1):19-23. Petropoulos VC, Arbree NS, Tarnow D, Rethman?M, Malmquist?J, Valachovic?R, et?al. Teaching implant dentistry in the predoctoral curriculum: a report from the ADEA Implant Workshop's survey of deans. J?Dent Educ. 2006;70(5):580-8. Chappell RP. Dental school implant survey. Oral Implantol. 1974;5(1):24-32. Weaver RG, Chmar JE, Haden NK, Valachovic?RW. Annual ADEA survey of dental school seniors: 2004 graduating class. J?Dent Educ. 2005;69(5):595-619. Chmar JE, Harlow AH, Weaver?RG, Valachovic?RW. Annual ADEA survey of dental school seniors, 2006 graduating class. J?Dent Educ. 2007;71(9):1228-53. Weaver RG, Haden NK, Valachovic RW, American Dental Education Association. Annual ADEA survey of dental school seniors: 2001 graduating class. J?Dent Educ. 2002;66(10):1209-22. Yuan JC, Kaste LM, Lee DJ, Harlow?RF, Knoernschild?KL, Campbell?SD, et?al. Dental student perceptions of predoctoral implant education and plans for providing implant treatment. J?Dent Educ. 2011;75(6):750-60. Huebner GR. Evaluation of a predoctoral implant curriculum: does such a program influence graduates' practice patterns? Int J Oral Maxillofac Implants. 2002;17(4):543-9. Maalhagh-Fard A, Nimmo A, Lepczyk?JW, Pink?FE. Implant dentistry in predoctoral education: the elective approach. J?Prosthodont. 2002;11(3):202-7. Barwacz CA, Avila-Ortiz G, Allareddy?V, Tamegnon?M, Hoogeveen?K. An overview of U.S. predoctoral dental implant programs and their directors. J?Dent Educ. 2015;79(3):265-77. Accredited dental schools. Ottawa: Canadian Dental Association; n.d. https://www.cda-adc.ca/en/becoming/dat/information/accredited/. Accessed 18 July 2016. Zimmermann R, Hendricson WD. Introduction of an implant surgical selective into a predoctoral dental curriculum. J?Dent Educ. 2011;75(9):1256-62. Garrison GE, McAllister DE, Anderson EL, Valachovic RW. Dental school vacant budgeted faculty positions, academic years 2008-09 to 2010-11. J Dent Educ. 2014;78(4):638-47.